Belgium captain Vincent Kompany has said that he will be fit to play against Russia in a World Cup Group H match on Sunday. Kompany has been out since sustaining a groin injury during Belgium’s 2-1 victory over Algeria. The inspirational Belgium captain has since undergone treatment, and has “no more worries” for the game. Belgium current leads Group H with three points ahead of South Korea and Russia, which both have one point, and Algeria with none. Victory over Russia will see Belgium progress to the round of 16. Here is an Associated Press article on Kompany. MOGI DAS CRUZES, Brazil (AP) — There is little not to like about Belgium defender Vincent Kompany at the World Cup. He has vision, poise and leadership — all the qualities teams look for in a captain. Well, there is one downside — he is injury prone. So when all players bar one came cycling down to the training pitch on Thursday, there was a sudden worry Belgium’s World Cup campaign might not look so perfect after all, despite the opening 2-1 win over Algeria. Kompany stayed up at the team hotel to treat a groin strain. With Sunday’s game against Russia drawing near, alarm bells were quickly ringing. Wilmots announced that the captain suffered from a “slight groin strain.” Kompany is not one to sit out a training for trifling issues. During the World Cup qualifier against Serbia he kept on playing with a broken nose and eye socket. You cannot grin and tough it out when it comes to a groin injury, though, as it would only get worse. Late Thursday, Wilmots added to the mystery by refusing to comment on the extent of the injury. “We are waiting. We have our medical staff there,” was all he would tell the Belgian VRT network. Even the players at training were surprised when Kompany failed to show up, as Wilmots had apparently kept them in the dark as well. “Players don’t have to know everything,” he said. If much has been made of injured stars like Luis Suarez for Uruguay, Radamel Falcao for Colombia and Cristiano Ronaldo for Portugal, it is because they stand out as forwards. 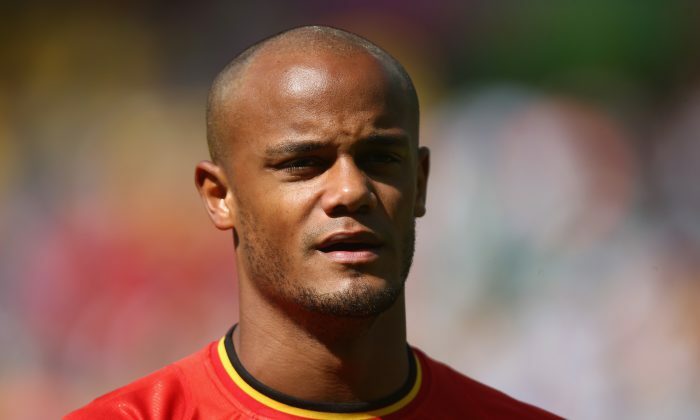 For Belgium, it is tough to think of a more important player than Kompany. At 28, he is the symbol of Belgium’s revival as a football powerhouse, leading the country to its first World Cup in a dozen years. The defender has already led his club Manchester City to two Premier League titles in three years. Beyond leadership, he would also be extremely useful against Russia, which is known for its fast switch from defense to attack that troubled many defenses during the qualifying campaign. If Kompany can’t play, the defensive leadership role would fall to 36-year-old Daniel Van Buyten, who has increasingly been criticized for a lack of speed. Thomas Vermaelen of Arsenal would likely play alongside him. Belgium can advance to the second round of the World Cup if it beats Russia at Rio’s Maracana stadium on Sunday. Kompany has so often been troubled by injuries that during a previous stint at Hamburger SV he was called “the man of glass.” Last season, a calf injury kept him out of action for several months and this year he has also had his troubles. On the positive side, things were looking up for Belgium’s other star player, Eden Hazard. The Chelsea playmaker had a toe contusion but moved freely during all of Thursday’s training session. Second-choice goalkeeper Simon Mignolet did not train with the rest of the goalkeepers for a second day running, suffering from a right hand injury.